It's easy to fall in love with the strikingly modern and luxurious Valentino II Black Queen Bedroom Set. This sleek set is sure to make a statement in your home, featuring solid hardwoods and veneers with an embossed inlay and a striking black finish. The dresser and nightstand feature full extension glide drawers that make for effortless and quiet operation, while their felt-lined top drawers provide the perfect place to store precious jewelry or other items. 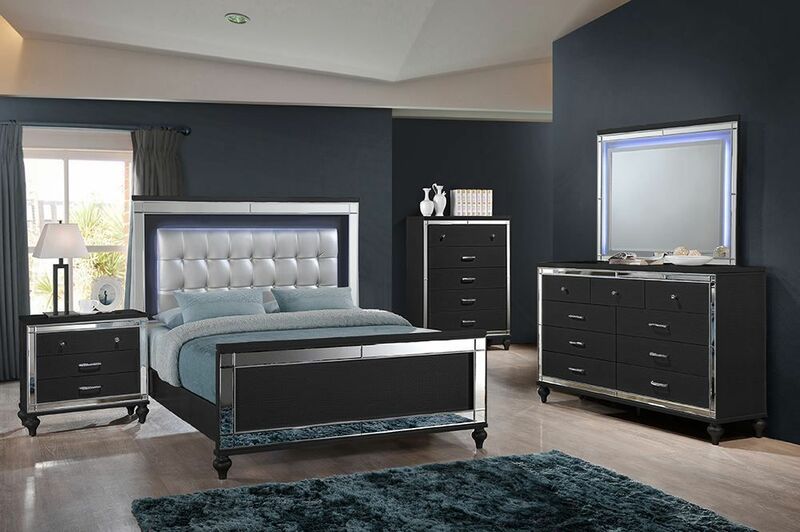 This set brings the word "modern" to life with its lighted headboard and mirror, uniquely exquisite features that aren’t always easy to find. Bring home the Valentino II Black Queen Bedroom Set today and dress up your space exactly the way you've always wanted. It's easy to fall in love with the strikingly modern and luxurious Valentino II Black Queen Bedroom Set.